At least that’s what a new show on the Carnival Victory says occurs once passengers head out of their staterooms and close the door. For Robin, it was the highlight of the cruise so far. “I got to sit on the stage,” the youngster proudly proclaimed. Carnival’s towel animals are whimsical terry cloth creatures that greet guests as they return to their staterooms each evening. 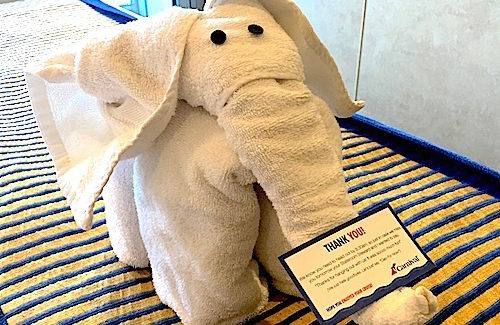 Carnival introduced its first towel animals in 1991, an industry first that was immediately popular and has now been replicated across the cruise industry. Each creation is the culmination of hours of training and practice, plus lots of creativity from the ship’s housekeeping staff. So popular have the towel animals become that Carnival Cruise Line has a book on creating the fluffy creatures. The book is for sale in the ship’s gift shop and on Carnival’s website. 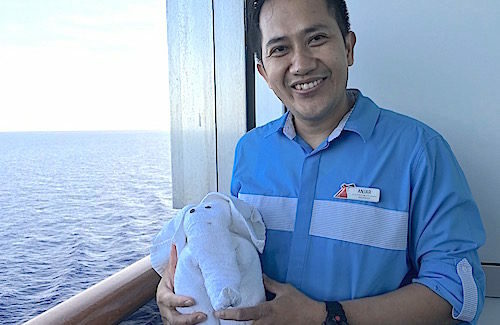 My stateroom steward Anjar is an expert at making towel animals and putting them on my bed every evening. “I learned by watching and by doing and by looking at the book,” Anjar said. So far I have seen towel elephants, seals, dogs, monkeys, frogs, lions, scorpions, rabbits, swans, turtles, ducks and fish. One time I returned to my room to find a towel monkey hanging from the ceiling. Another time it was a swan resting on the bed wearing my sunglasses. “Passengers like it, and I like to make my guests happy,” Anjar said. 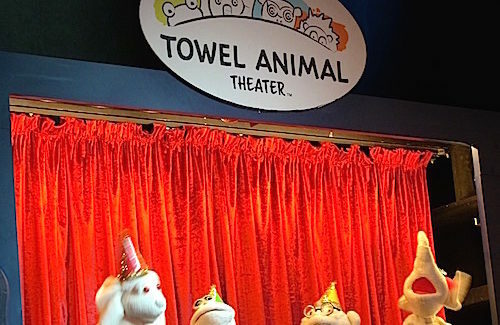 As for the Animal Towel Theater, it attracted a good turnout of adults and children. Kids were invited to sit on the stage where they could get up close to the action. The plot of the half-hour production seemed to be that towel animals “just want to have fun,” as one of the puppet critters sang, and that everyone is unique and important in their own talented way. Good message to remember. Don’t know if I will ever look at those ubiquitous towel animals in the same way ever again.